1. Hamas takes its name from an acronym that means “Islamic Resistance Movement” in Arabic. 3. 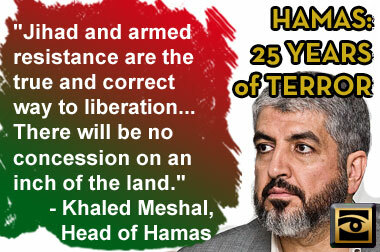 Hamas is committed to jihad. Its charter stresses the importance of jihad (holy war) as the main means for the Islamic Resistance Movement (Hamas) to achieve its goals: An uncompromising jihad must be waged against Israel. Jihad is the personal duty of every Muslim. 4. Hamas is an anti-Semitic organization. According to its charter, the Jewish people have only negative traits and are presented as planning to take over the world. The charter uses myths taken from classical European and Islamic-based anti-Semitism. 5. The Hamas Charter includes anti-Semitic myths taken from The Protocols of the Elders of Zion (mentioned in Article 32) regarding Jewish control of the media, the film industry and education (Articles 17 and 22). The myths are constantly repeated to represent the Jews as responsible for the French and Russian revolutions and for all world and local wars: “No war takes place anywhere without the Jews’ being behind it” (Article 22). The charter demonizes the Jews and describes them as brutally behaving like Nazis toward women and children (Article 29). 6. Hamas is the local Palestinian branch of the Muslim Brotherhood, which recently took control of the Egyptian government. 7. Hamas is designated as a terrorist organization by Israel, the United States, Canada, the European Union and Japan. 9. Hamas’s first ever suicide bombing took place on April 16, 1993 when a suicide bomber detonated the car in which he was driving at the Mehola Junction near Beit El. 10. On January 27, 2002, the first female Palestinian suicide bomber, Wafa Idris, blew herself up on Jaffa Street in the heart of downtown Jerusalem, killing one person and injuring about 100 more. Hamas claimed responsibility. 11. Hamas has been responsible for many appalling acts of terror including the suicide bombing in the Park Hotel in the coastal city of Netanya, in the midst of the Passover holiday seder with 250 guests. Hamas claimed responsibility for the attack in which 30 people were killed and 140 injured – 20 seriously. 12. In December 2011, Hamas “celebrated” its 24th anniversary, boasting that it had killed 1365 “Zionist soldiers” since 1987. Hamas does not differentiate between Israeli soldiers and civilians. 13. Hamas won a four year term at the head of the Palestinian Legislative Council in 2006 but remains in office indefinitely. 14. In June 2007, Hamas took control of the Gaza Strip through a violent coup, killing numerous Palestinians, some by pushing them off of tall buildings in Gaza. The Red Cross estimated that at least 118 people were killed and more than 550 wounded during the fighting in the week up to June 15. 15. Hamas members use Palestinian children as human shields when carrying out attacks on Israeli soldiers. “‘I do not want Zahwa’s [Arafat’s daughter’s] friends in the future to say that Yasser Arafat abandoned the Palestinian cause and principles. I might be martyred, but I shall bequeath our historical heritage to Zahwa and to the children of Palestine.’” . Not only do they behead infant civilian Jews but they sacrifice their own children and brag about it. And still the world pretends they are freedom fighters,not Jew hating barbarians. Leftists like to quote this Voltaire, usually whining that the evil empire of Republican America crushes them for speaking against it, or that criticizing Israel’s right to defend itself might be called antisemitism. After all, look what happened to the Dixie Chicks after they stuck it to George Bush!!! This doesn’t take into account that others are allowed to criticize back in the free world. It reveals ingratitude and entitlement and the utter disconnection from the facts that freedom is rare and precious and we landed in it because heroes risked and gave their lives. It is not the natural state and it is still rare around the world. A few weeks ago, six Palestinian men were shot point blank in the streets of Gaza, then at least one was tied to a motorcycle and dragged through the streets. That’s what happens when you dissent from Palestinian propaganda. You might be called an antisemite, and rightfully so, if you criticize Israel’s right to exist. But no Jew is going to cut off your head to silence you. Indeed, Israel is so moral that even though they technically have the death penalty, they’ve only used it twice. Criticize actual crimes within Islam, however, such as the death penalty for blasphemers, and you risk being put to death. Even if you don’t live under sharia law. Vigilante violence is common- recall the innocents around the world slaughtered by mobs in protest of the Florida pastor’s burning of the koran. Saudis and Iranians can burn countless bibles, and egyptians and nigerians can burn churches with Bibles and living people in them, but this act meant innocents were butchered thousands of miles away. How many human rights activists, Muslims and ex-Muslims live with bodyguards because death threats and attempts on their lives are commonplace, even in America or Holland or Canada? The jails in Cuba are overflowing to this day with writers and artists and homosexuals and blacks- since communism is about erasing individuality and making everyone the same, those who hold different views are tortured or put to death. In communist China and Russia, countless millions were executed for political dissent. In socialist Germany, aiding and abetting Jews or views contrary to the Fuhrer’s meant certain death or exile. The next time useful idiots of the left “occupy” or howl in Adbusters about the evils of capitalist culture, they might use a few brain cells and think about the actual record of the systems that they are fighting for. Very righteously they pretend to care about the poor, the female, and the freedom to speak against the state. And they never think for a moment that, despite its flaws, the state they live in is the freest, most equal, most prosperous one that has ever existed. Capitalism and freedom go hand in hand, and anyone who cares about the poor or the right to dissent ought to be fighting tooth and nail to bring capitalism to the places that don’t have it, so they can share in the freedom that we have. This is from Noam Chomsky’s book, Chronicles of Dissent. Really? How can someone who writes this crap be respected as an intellectual and thinker? The historical record shows unequivocally the opposite, the constant starting of wars and refusal of peace attempts. I also have news for you, Chomsky, the PLO was a metastasizing cancer although I’ll have to take your word for it that the Israelis said so. Arafat was one of the most corrupt and despicable leaders anywhere. If someone slaughtered a bunch of your friends at the Olympics, tortured them like dogs, castrated- it would be okay for you to call that gang a cancer. That’s not “liberation” and it’s targeting civilians – in A DIFFERENT COUNTRY- who have nothing to do with the war. But you know this. Because you’re not stupid. Which makes you a greasy antisemite and a corrupt, despicable and evil person. More evil than the Muslims who have been brought up to hate Jews who don’t know any better. But what really made me laugh is “I’m not familiar with those because they’re mostly fabricated.” Yeah, we’re making it up when we quote directly. PA TV program Personal Encounter interviews writer and philosopher Maen Bashour. Program filmed in Beirut.